On September 19, the U.S. Drought Monitor reported that 90.65 percent of the State was abnormally dry or drier. 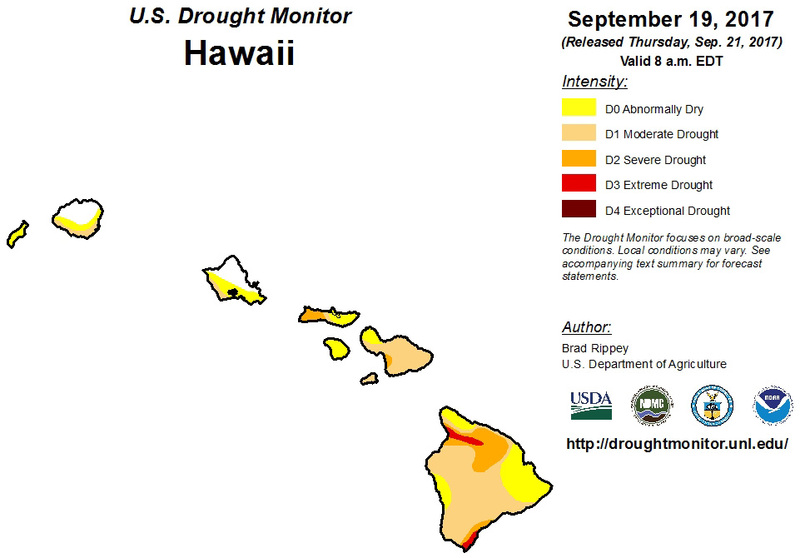 Hawaii continued to experience warmer- and drier-than-normal weather. Lihue, Kauai, posted daily-record highs of 89°F on September 12, 15, 17, and 18. Although Hawaii’s drought depiction was largely unchanged, there was some further deterioration (mainly, expansion of severe drought, or extreme drought) on the lower leeward slopes of the Kohala Mountains on the Big Island due to declining pasture conditions. Complete information provided by the Drought Monitor can be found on their website at droughtmonitor.unl.edu. For the week ending on September 24, 2017, the state rainfall averaged 0.43 inches. The Waimea Irrigation Systems level at the Puukapu reservoir was marked at 50.00 feet (51.70 MG) as of Friday, September 22, 2017, up 2.00 feet from the previous Friday reading. The Puu Pulehu reservoir was marked at 18.50 feet (106.75 MG) on September 22, unchanged from the prior week. A mandatory ten percent conservation remained in effect. The Honokaia Reservoir was at 8.00 feet (1.00 MG) as of September 15, same as the previous Friday reading. The water level at the Paauilo reservoir was marked at 21.00 feet (10.00 MG) on September 22, same as the previous Friday reading. The Paauilo and Honokaia Reservoirs feed into the Lower Hamakua Irrigation System where no conservation measures were in effect. The Waimanalo Irrigation System water level was marked at 52.50 feet (42.60 MG) as of September 22, 2017, up 1.50 feet from the previous Friday reading. No conservation measures were in effect. The Molokai Irrigation System water level was marked at 30.25 feet on Friday, September 22, 2017, down 0.25 feet from the previous Friday reading. Conservation measures urged all non-homestead water users to cutback water consumption by ten percent. The Waikamoi reservoir #1 water level was marked at 0.00 MG on Friday, September 22, 2017, down 0.80 MG from the previous Friday reading. The Waikamoi reservoir #2 water levels was marked at 0.00 MG on the same day, down 2.90 MG from the previous Friday reading. Each reservoir has a 15.00 MG capacity. The Kahakapao reservoir #1 was marked at 38.30 MG on Friday, September 22, 2017, down 3.40 MG from the previous Friday reading. The Kahakapao reservoir #2 water levels was marked at 38.10 MG on the same day, down 3.40 MG from the previous Friday reading. Each reservoir has a 50.00 MG capacity. The Piiholo reservoir was recorded at 40.30 MG on Friday, September 22, 2017, up 3.20 MG from the previous Friday reading. This reservoir has a capacity of 50.00 million gallons.